Let’s face it. Saving money on groceries really isn’t always all that much fun. Oh sure, at first it is exciting and perhaps even a little addicting to realize that by making just a few tweaks, you can actually cut your grocery bill in half. But eventually, once that initial thrill of filling your grocery cart for pennies on the dollar has finally worn off–and for some people that process takes longer than others–the reality is that being diligent about shopping the sales, finding the best deals, and using coupons can take its toll. It’s called coupon burnout, and quite frankly, it happens to the best of us. The problem is not that we don’t care, or even that we don’t want to save money. Who, after all, really wants to spend more than they have to? No, the problem is not a lack of desire, or even one of willpower. Most often, the problem of savings burnout comes from a combination of two things: a.) not enough time to focus on savings and b.) trying to save too much on too many things. For some, our burnout comes primarily from a lack of time in the day. Between kids and activities and work responsibilities, we are stretched to the max and having to save money on groceries just feels like one more obligation. Conversely, some of us get so obsessed with saving money that we are trying to save everywhere on everything at all times. We become panicked at the thought of “missing” a deal. We check multiple coupon sites multiple times a day and still hit every drugstore and grocery store in our area each week, even though our stockpile might already be big enough to carry us through to the next decade. We’re exhausted, but we can’t stop. 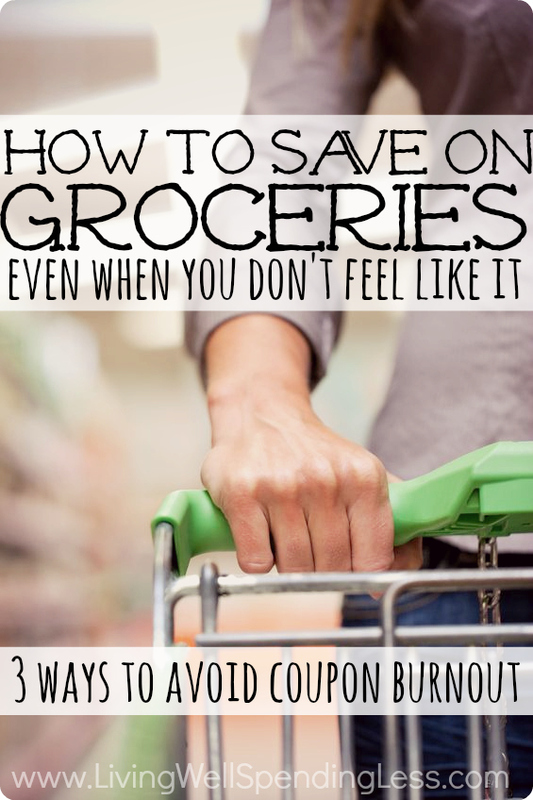 The rest of us most likely fall somewhere in the middle of those two extremes, and somewhere along the way saving on groceries has become more of a burden than a blessing. While I can’t magically wave my wand and suddenly get you motivated once again, I can offer three concrete ways to avoid coupon burnout and still save on groceries even when you don’t really feel like it. The first step in combating savings burnout is to stop being so hard on yourself. 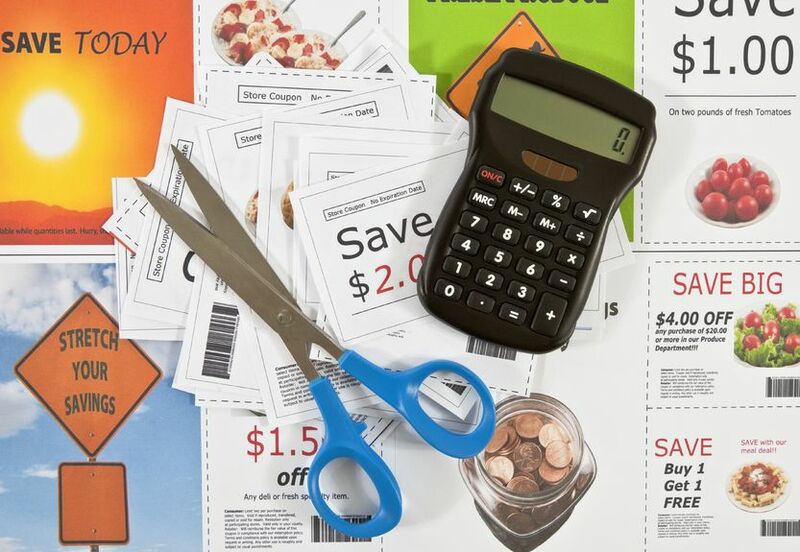 If you are struggling with finding enough time to clip coupons, give yourself permission to instead just focus on buying what’s on sale, or generic, or the things your family really needs. If you are killing yourself trying to keep up with every good deal, give yourself permission to miss a sale or simply skip a few weeks. Remember that saving money on groceries is not all about the coupons, it is about buying groceries at their lowest prices, then stocking up until they go on sale again. You don’t have to go to every store every week searching for every single deal. There will always be more sales! Instead, try focusing on one store–whichever store seems to offer the best overall savings–and simply shop the sales as much as possible, using coupons if and when it is possible. This applies to all foods in all price ranges for all diet types, whether you prefer shopping at Save-a-Lot or Whole Foods. This also means taking advantage of all the fresh seasonal garden produce that is available. That could mean spending a Saturday morning haggling at the local farmer’s market or scoring a spur-of-the-moment great deal at a roadside stand. Perhaps it means tending to your own garden, or bartering with a neighbor for some of their garden overflow. 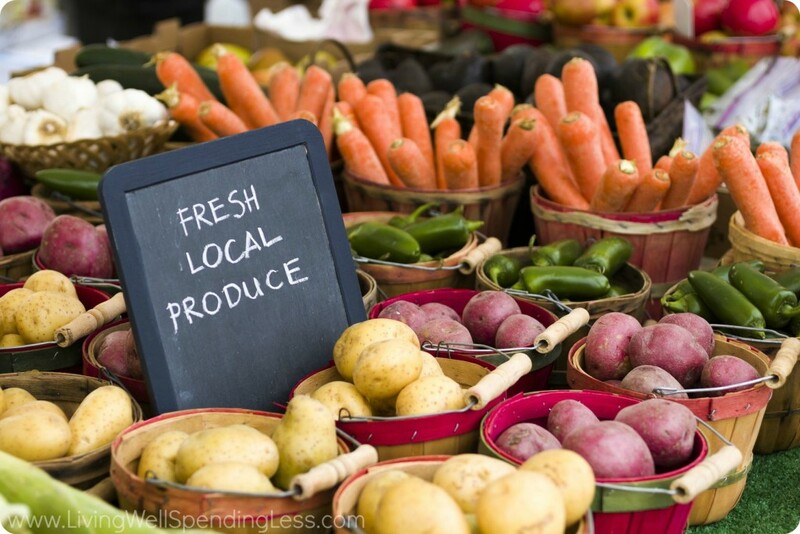 It might even mean taking the kids to a U-Pick farm or orchard for a few hours, which is a very fun way to spend time together AND save on produce all at the same time. Giving yourself grace also means recognizing your limits and being willing to make a change. About a year and a half ago I started to really feel burned out by drugstore shopping. I was tired of spending every Sunday afternoon first planning my transaction scenarios, then driving to multiple stores because one happened to already be out of one of the big promotions. Over the years I had saved thousands of dollars on toiletries, cleaning supplies, and paper goods, but I finally decided enough was enough. I took back my Sundays and instead of shopping the drugstores each week, I began ordering my paper towels & toilet paper through Subscribe & Save on Amazon and I started making my own cleaning supplies. Those small changes didn’t end up costing much more, but they made a big difference to my sanity, which in the end was well worth it. Adopt the mantra that any savings is better than none, and realize that saving on groceries and toiletries is not an all-or-nothing proposition. Pat yourself on the back for saving where you can instead of beating yourself up for not saving more. The best way to spend the least amount of money on food with the least amount of effort is to stop shopping altogether. Take a break from grocery shopping–and all non-essential spending in general–and put your family on a one month spending freeze and pantry challenge. With the exception of perishables like milk, bread, and fresh produce, commit to eating only what you have on hand in your pantry & freezer. Yes, it might seem hard or almost impossible at first, but I promise you’ll be surprised at how liberating and invigorating a month of no spending can be. You’ll be amazed at how much extra time you suddenly have when you cut out the often time-consuming task of shopping, whether it be for food, clothing, or anything else. Use that extra time to reassess your finances, to regain control of the parts of your life that are feeling chaotic, and to simply refresh your psyche. At the end of a month, you will not only have saved a ton, you will be re-motivated and rejuvenated and ready to maintain your savings streak in a proactive way. Some of the most common complaints I hear from time to time is: My kids are home from school and it is just SO HARD to try to focus on saving money with coupons when they are around begging for something to do all the time. Plus they eat me out of house and home! While it is absolutely true that the huge change in family dynamics can make you feel a little “off,” why not put that boundless energy to work? If your kids are old enough to be in school, they are old enough to learn how to help with coupons and saving money on groceries. It is extremely important for kids to learn that food costs money, and that saving money on food means there is more for for other things. It is also a great confidence builder for kids to learn how to contribute to the family! Depending on their ages, kids can help with everything from sorting coupons into your coupon binder (my girls think this is SO much fun!) to comparing sale ads and learning how to price match, to planning & cooking some of the meals. There are so many great lessons–from reading and math to home-ec, budgeting, and critical thinking–that it is practically a disservice NOT to teach your kids how to shop with coupons. And if you are not already a coupon shopper, you can learn together by following my step-by-step Beginner’s Guide to Coupons. Chances are you will be surprised at not only how eager your kids are to learn, but how much renewed passion you will find through teaching and guiding them in the process. And as a result, your savings will multiply–it is the gift that keeps on giving! Jessi, it is so great that you are finding a good balance! Kudos for figuring out exactly what works for you! These are all great and true tips. It can be difficult when there are so many good deals. But sanity and family need to be a priority. I have been making many if my own cleaning products too. This could have come at a better time! I have been feeling so burned out with coupons, exactly for the reasons you said. I have so much stuff in my stockpile but I keep buying more, and I don’t even know why. I am going to take your advice and take a break from spending this summer. Thanks Ruth! It IS tiring to try to find all the deals. Especially since I have been going over budget lately, and feel like I need to search for coupons and save even more. Thanks for the tips! I am a CPA so I am really busy during tax season. I love stocking up throughout the rest of the year and then barely shopping during tax season. That way when the pressure at work is greater I don’t have to worry about grocery shopping. I use to be a heavy couponer going to CVS, Rite Aid, and Walgreens everyweek in addition to Giant Eagle for deals. When I had my 3rd child, I just don’t have the time or energy to dedicate to it anymore. I still stockpile when I find a good deal but now I only go to CVS about twice a month when there are sales worth my time. We now shop for most of our groceries between Aldi’s and Costco. It is so easy and convenient and the prices are great even without coupons. I am happy with my current state and do not miss the deal scrambling every week. Once and awhile I get hit with a couponing bug and do a bit of shopping, its a nice balance. I have found that I am happy with the “little” wins. If I can save a few bucks here and there, or save items on big purchases, then I feel like I’ve accomplished the goal of saving my family money. I think though, being overconsumed with it is not providing any benefit to my family and honestly causing ME more anxiety! When it comes to groceries, I found I am more interested in making sure its the right food. Sometimes the coupons are for the stuff you really don’t want to be eating any way! I coupon every week. I make sure I limit myself up to 6 hours a week couponing and shopping. I work from home and my kids are at school. One of those days I pick, I do everything on same day. I don’t clip coupons. I keep it in a file box organized by inserts. I also have a group of ladies who coupon with me. They spend the same amount of time couponing. We get together every Sunday morning for coffee and coupon chats. We find deals through each other that we might like. It’s a community task and we literally are nowhere close to burnout. (At this for almost two years!) 🙂 your tips are excellent and will definitely try making some cleaning supplies! I have always been a couponer ever since I had to go shopping for groceries. However, the past few months I have slacked off completely. I am so busy with my blog that I can’t see to find or even want to make time for coupons. I tell myself it may be just a season and I may be able to get back to it eventually. I have learned multiple other ways to keep our grocery bill down. We have some great grocery outlets around that save me a lot of $. I also do some ordering through Amazon subscribe and save. I used to coupon A LOT. Not to the extreme that “the show” portrays couponers, but I was easily spending 10-15 hours per week on it. And then I got pregnant and wham-bam! I couldn’t get off the couch. By that time, I had also fallen prey to coupon burnout. Here’s my advice (there’s 2 parts): Shop the sales and watch for clearance deals, but coupon for just one or two things that really hit your wallet. For me, I continue to coupon for diapers and wipes. With a daughter who isn’t showing interest in potty training and a baby due in October, it is worth my time to coupon for these items. You can either stockpile when there’s a great deal (e.g, when Kroger puts wipes .99/pack), or buy a little more than you need as you go (e.g. the occasional Amazon deal or clearance find). Advice, part 2: Look into as many homemade, multi-task items as you can. You can make a whole lot of personal care and cleaning items from coconut oil, castile soap, and/or vinegar. Not only will it save you space, you will be spending less time couponing for these items, saving money, and using products that are better and safer for your family.